As per last months news update, we have now completed the brand identity and marketing graphics for Riot Lab Films and their award winning feature film The Englishman. To view more of the work please visit the print media section of our online portfolio. Mavo are currently working on the brand identity and graphics for a new Independent feature film entitled: “The Englishman”. More details of this project will follow soon. We have recently designed and developed our new online portfolio. A comprehensive selection of print, web and multimedia projects have been added but we’ll continue to keep it up to date as we grow. Mavo have been working on an ongoing project for a leading PR firm to increase awareness of Hep C.
While we continue to develop the graphics and marketing media for the launch of an “informational documentary” on the subject, we have designed a press ad and poster before the official launch of the healthcare campaign. Asked to develop the logo for “trendy new film company” A-Z films, Mavo jumped at the chance. Here’s one of the final concepts. To coincide with Danone “Essensis Good Skin Week”, Mavo were asked to create the promotional logo and bespoke invitations. For further examples of our “concept branding work” check out our recently updated and downloadable branding folio. In association with Frank PR, Mavo studio have created the press images for Npower’s highly original “star advertising” campaign. For more information about this please read the article recently featured in Marketing Week. Every so often designers get landed with a brief that reminds of where it all began: “drawing pictures in sketch books until your mum turned out the light”. This month Mavo have been part of the PR launch of Stony Organic Yogurt. As part of Stony’s launch in the UK, Frank PR asked us to design and develop the promotional site for a “carbon friendly” horse and cart ride, to encourage more “eco-friendly” ways to travel. The site may also be the first introduction for many UK visitors to the Stony brand and its uniquely illustrated set of characters (so we designed some quirky animations to give them even more life). Crazy graphics and funky animation may suit trend setting media agencies, but the need for functional design with a clarity of information is of equal importance to the corporate sector. As such, Mavo have just completed the design of a new website for law firm Masseys LLP, using a simple grid structure, lots of white space and a clear and legible use of typography. 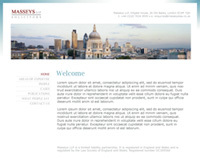 You can visit the latest version of the new design at www.masseyslaw.co.uk. Mavo have designed the new brand identity for Jasmine Apartments. Based in Grindelwald Switzerland, Jasmine Apartments offer a “luxury Swiss chalet experience”… shameless plug over with, now can we have our free ski passes? Sometimes, working with other people in the “creative” industry can be inspiring and difficult in equal measures. If creative minds clash, all hell can break lose, not to mention the copious amounts of wasted paper. Luckily, our experience of working with photographer Yvonne De Rosa has been nothing but a pleasure, so, when she asked us to design and develop her online portfolio, we jumped at the chance. Classic and mysterious, Yvonne’s work speaks for itself. Without wishing to invade the message, a minimal design approach was adopted to allow the work to speak to an audience with as little “graphic intrusion” as possible. Mavo have recently designed the brand identity for Fubar Leisure, who are opening a new chain of bars, aptly named Fubar. We will also be interior designing their first bar (which will be launched later this year) and designing the website to coincide with the opening. Details of this will follow soon. At the beginning of this year Mavo were commissioned to design and develop a high profile website for prostate cancer patients. This proved a useful learning experience for us: discovering how to balance design without overwhelming an elderly person or someone who may not have a great deal of experience using the internet. Next month, the site is to be translated into several other languages and launched across Europe. More recently, Mavo have won another high profile healthcare campaign: promoting Hepatitis C awareness across the UK. More news of this will follow soon. If you would like to feedback about our new website please feel free, we’d welcome any of your comments. Likewise, please have a look through our recently updated portfolios, which we’ve now divided into several easy to view categories! After a really tight deadline, Mavo have just completed some character designs, banner animations and interactive animations for a new “lifestyle / business” web portal. Likewise, Mavo designed the look and feel of the website, allowing every user the ability to cutomise the site according to their own tastes. The final website is due to go live later this year. Mavo have been quoted in the ESCRS Euro Times publication. In August 2008 our Creative Director took part in a discussion on “Good practice in web design and web marketing”, here’s what he had to say… (444Kb pdf).